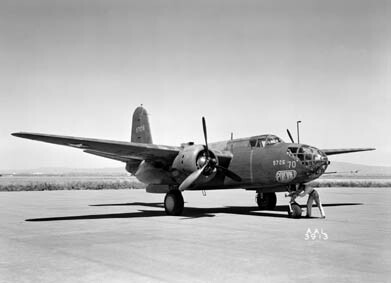 As a consequence of the United States involvement in World War II, a number of aircraft were sent to Ames by the military services for the principal purpose of obtaining flying qualities evaluations and stability and control and performance assessments using the expertise of Ames pilots and engineers. Many of these aircraft spent a relatively short time at the laboratory, but a few were modified substantially and then used in more extensive research programs. 15 The individual programs had several objectives, including exploratory evaluation of performance and flying qualities and, in some cases, in-depth investigation of specific problems and evaluations of design modifications. The results of these evaluation programs provided a wealth of data, not only useful as they related to the individual aircraft themselves, but as a source from which the military drew to develop flying qualities specifications for future aircraft. 16 It is not possible to comment on the results of all of these tests, for few formal NACA reports were prepared. Instead, the information was disseminated to the military and the manufacturers through informal memoranda that are lost to the authors. In some cases, the only remaining information about these programs comes from Don Heinle's brief notes and from personal recollections of individuals who took part. The following discussion provides an indication of the variety of investigations that were conducted during those years. Table 4 lists the many aircraft that were part of this activity. 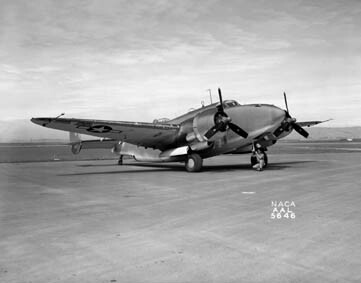 Photographs that are available for several of the World War II aircraft appear in figures 34-53. 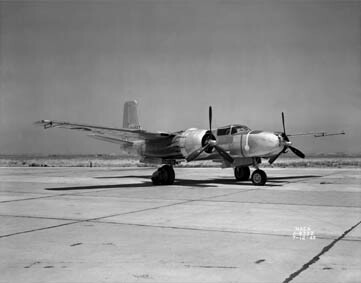 The aircraft at Ames that were heavily instrumented for flying qualities evaluations and stability and control measurements were the A-20A Havoc, B-25D Mitchell, A-35A Vengeance, B-26B Marauder, BT-13B Valiant, PV-1 Ventura, XP-75A-1 Eagle, XP-47M-1 Thunderbolt, P-51F Mustang, F4U-4 Corsair, P-61A-5 Black Widow, SBD-1P Dauntless, and the XP-70 (the first American night fighter, converted from the A-20 Havoc). 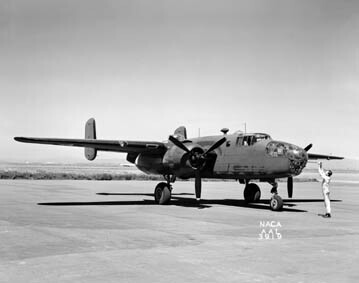 The B-25 was also used for engine-out control tests. Seth Anderson, William Turner, Thomas Keller, Richard Spahr, and Robert Reynolds all participated in these tests. 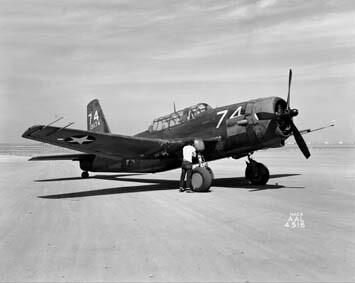 Flying qualities evaluations were also carried out on the XF7F-1 Tigercat, a short-coupled aircraft with two large radial engines. It underwent modification to enlarge the vertical stabilizer based on development tests in the 40- by 80-foot wind tunnel. George Cooper conducted critical tests of engine-out wave-offs to assess the effects of the larger fin on directional stability and control. Tests showed flying qualities to be satisfactory with the exception that roll performance did not meet the military's specifications (ref. 40). 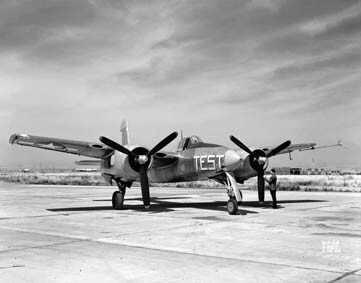 Flying qualities tests on the A-26B Invader led to modifications to the longitudinal and lateral control systems to reduce maneuver control forces based on results of tests obtained in the 40- by 80-foot wind tunnel. Flight evaluations confirmed that the control forces had been reduced to an acceptable level. 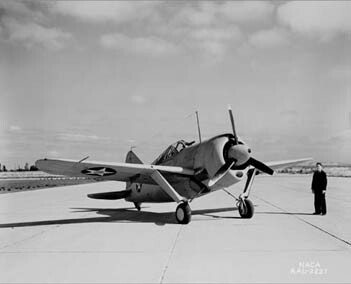 The FM-2 Wildcat was used for evaluation of carrier landings. Figure 34. 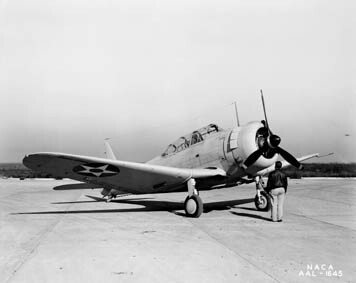 Douglas SBD-1P Dauntless. Figure 35. Vought-Sikorsky OS2U-2 Kingfisher. Figure 36. Brewster F2A-3 Buffalo. Figure 38. Douglas A-20A Havoc. Figure 39. North American B-25D Mitchell. VARICAM, or variable camber tail. In the latter case, the percentage of horizontal stabilizer chord dedicated to the elevator was increased and sectioned into two deflecting segments, thus effectively varying the camber of the entire stabilizer. Flap effectiveness was nonlinear and was observed to fall off with flap deflection. Roll control was not satisfactory, having poor forces and feel characteristics (ref.41). The VARICAM did prove to be satisfactory and increased pitch-control effectiveness somewhat (ref.42). The lift-drag polar and static stability margins of the F2A-3 Buffalo were established. 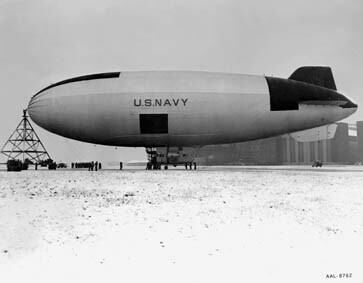 The Buffalo's wing was subjected to a static torsion test, and wing torsion was measured in flight. 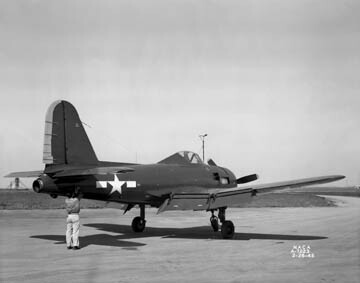 Flight tests with the SB2D-1 confirmed the results of extensive wind tunnel tests in the 7- by 10-foot and 40- by 80-foot wind tunnels, which predicted poor performance because of high drag and poor roll control at low speed. Figure 40. 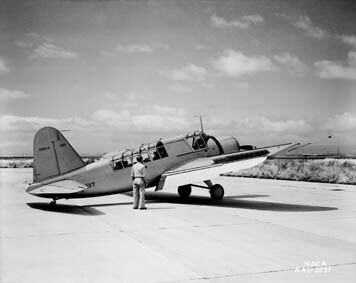 Vultee A-35A Vengeance. Figure 41. 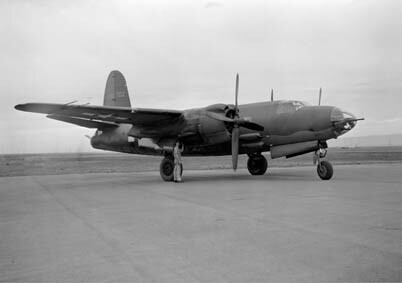 Martin B-26B Marauder. Figure 42. Lockheed PV-1 Ventura. Figure 44. Northrop P-61A-5 Black Widow. Figure 45. Douglas BTD-1 Destroyer. Figure 46. 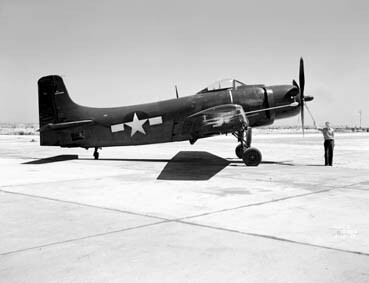 Grumman XF7F-1 Tigercat. Figure 47. General Motors XP-75A-1 Eagle. Figure 48. 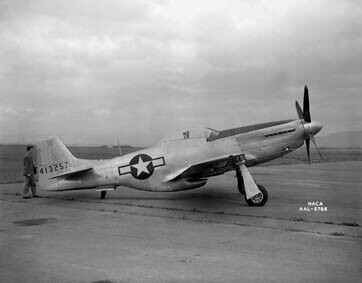 Republic XP-47M-1 Thunderbolt. Figure 49. Ryan FR-1 Fireball. Figure 50. Grumman FM-2 Wildcat. Figure 51. Douglas A-24B Invader. 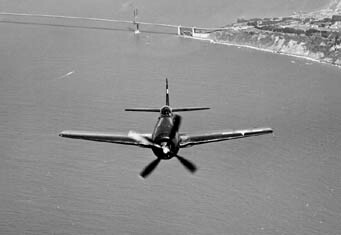 ....were of a short duration with the objective to obtain data concerning problems with a specific aircraft. The collection of post-war aircraft is shown in figures 54-63. 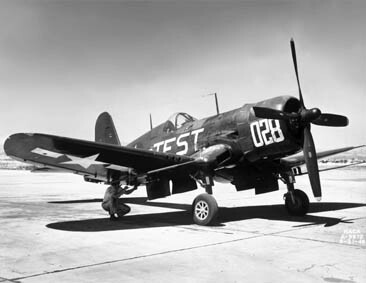 Stability and control and flying qualities evaluations were carried out on a number of high-performance propeller and jet aircraft, including the XBT2D-1 (Skyraider prototype), F6U-1 Pirate, F7F-3 Tigercat, F8F-1 Bearcat, F-84C Thunderjet, F-84F-5-RE Thunderstreak, and the F5D-1 Skylancer. 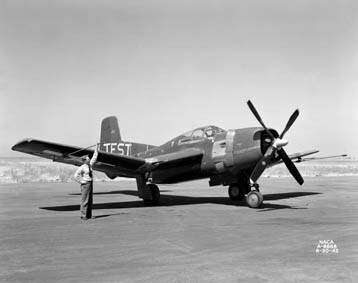 The F8F-1 was also used to examine buffet, including tests with the propeller feathered and engine shut down to permit the aerodynamic contribution to be identified. 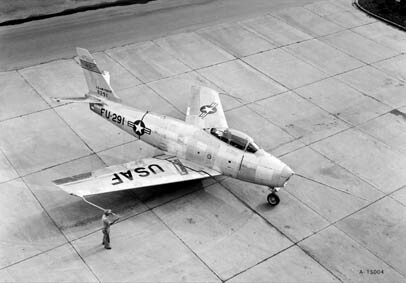 The F-86A Sabre underwent stall and spin testing. 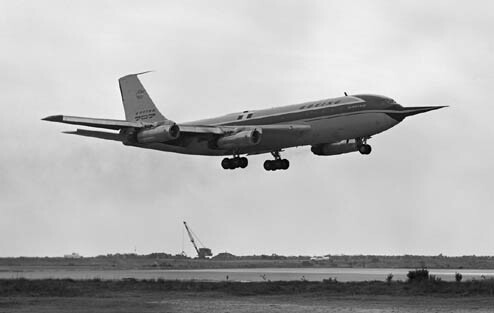 The prototype of the Boeing 707 commercial jet transport, the 367-80, was used for developing flying qualities criteria pertaining to large transport aircraft designs. That program was run by Hervey Quigley. Several specialized tests were performed for a variety of purposes. In this category, the F-100C T-ALCS demonstrated a normal acceleration-command control system. 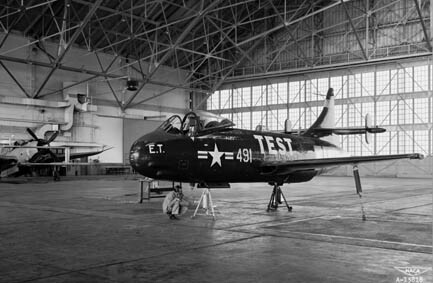 The T-33A-5 Shooting Star performed zero-g flights and was used for pilot physiological studies. Tail-load tests were carried out on the XR60-1 Constitution. Finally, the L-4 Cub was used in evaluations of a castering landing gear for takeoff with 90 degree crosswind. The latter was one of Bill McAvoy's final test programs. Two studies were carried out on the B-47 Stratojet, one concerning measurement and prediction of response characteristics of a flexible airplane to elevator control (ref. 43), the second on experimental and predicted longitudinal and lateral-directional response characteristics of a swept-wing airplane (ref. 44). The results provided an indication of the detail required in the analytical models to adequately predict the aeroelastic behavior of the airplane. These studies were carried out by Henry Cole and Stuart Brown and were performed jointly with the NASA High Speed Flight Station. All flights for both programs were conducted at Edwards Air Force Base. These focused test programs served a useful purpose for the manufacturers and the military in resolving problems with the various designs. Along with them, more enduring efforts were carried out at Ames that had a broader impact on the technology. In one case, tests in the 7- by 10-foot wind tunnel were used to develop predictions of flying qualities, particularly concerning the influence of propeller slipstream effects on stability and control. Harry Goett, Roy Jackson, and Steve Belsley published the summary report of this work (ref. 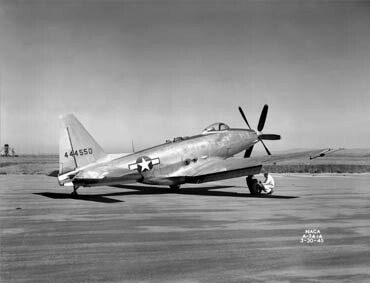 45), which instigated flight tests with a number of aircraft, most extensively with the Navy's twin-engine patrol aircraft, the PV-1, and lent credibility to the prediction methods (refs. 46 and 47). The flights showed that the wind tunnel results anticipated the unsatisfactory longitudinal characteristics attributed to high control forces in maneuvers and landings. Power effects were confirmed to be critical contributions. The high aileron and rudder forces, which adversely affected roll and engine-out directional control, were also substantiated. Examples of results from other programs which worked their way into the military's flying qualities design specification appear in references 48-57. In 1947, the Octave Chanute award was given to Larry Clousing in recognition of his contributions to the flying qualities evaluations of a number of the early aircraft and for his work in aerodynamics experiments. Figure 52. Chance Vought F4U-4 Corsair. Figure 55. Douglas XBT2D-1 (Skyraider prototype). Figure 56. Grumman F8F-1 Bearcat. Figure 57. 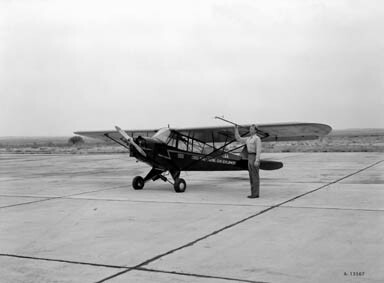 Taylorcraft L-4 Cub with Seth Anderson. Figure 58. North American F-86A Sabre. Figure 59. Lockheed XR60-1 Constitution. Figure 60. Vought F6U-1 Pirate. Figure 61. 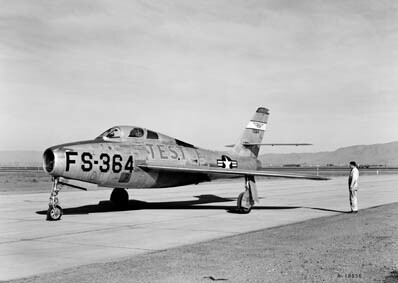 Republic F-84F-5-RE Thunderstreak. Figure 62. Vought F7U-3 Cutlass. Figure 63. Boeing 367-80 (prototype for the 707 jet transport). Figure 64. 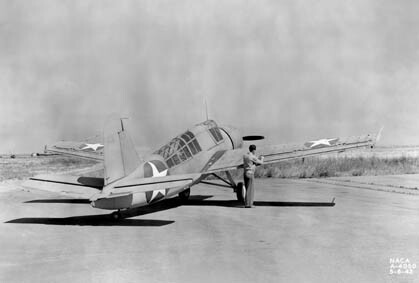 Mirror landing aid at Crows Landing, Calif.
As a consequence of its long involvement in flying qualities assessments of a wide variety of aircraft, Ames was called upon for specific projects that were of concern to the military services. One particular program stands out in this regard. 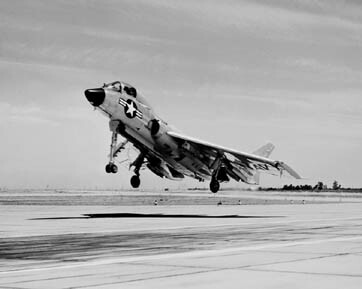 In the mid-1950s, the Navy was intent on establishing the influence of flying qualities on the minimum acceptable approach speed for landing on an aircraft carrier, and turned to Ames to carry out the program. That effort, led by Maurie White, involved the evaluation of 10 aircraft in 41 different configurations. 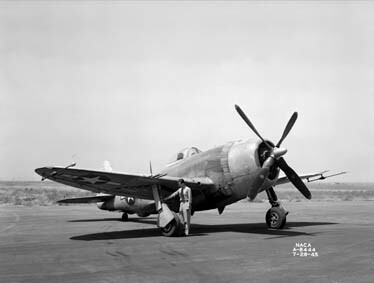 The Navy sent different aircraft every 2 months to Ames to be instrumented and flown in that program, 19 including the F4D-1, F7U-3, and F9F-6; in addition, the FJ-3 and F9F-4, which were also involved in boundary-layer control research, were also used. Along with these five, Ames flew five Air Force aircraft to broaden the sample, including the F-84F-5-RE, the F-86 E and F, the F-94C, and the F-100A. Configuration variations included flap type and setting, wing leading-edge configuration and flow-control devices, and boundary-layer control systems. In that experiment, extensive pilot opinion data were obtained concerning the stability and control characteristics that influenced the acceptable approach speed. The subsequent report (ref. 58) included comparisons with existing approach-speed selection criteria. 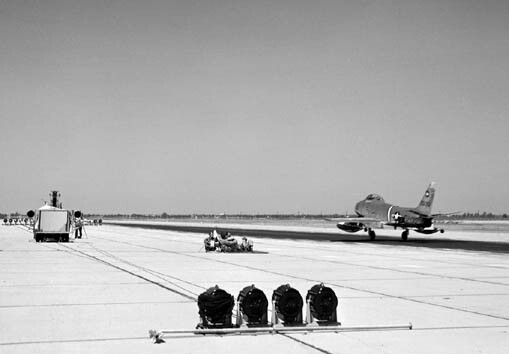 Most of the flights were conducted by George Cooper, Bob Innis, and Fred Drinkwater and took place at the remote test site at the Crows Landing Naval Auxiliary Landing Field in the central valley area east of Moffett Field. Figure 64 shows the mirror landing aid adjacent to the Crows Landing runway that was used for approach guidance. 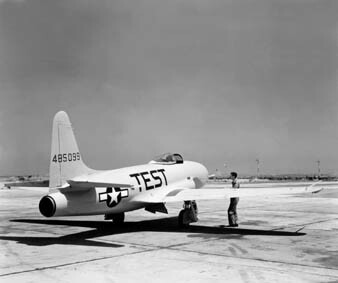 This program was one of the earliest in which ground-based simulation began to play a complementary role with flight test in assessing flying qualities. White and Drinkwater carried out a study of the effects on selection of approach speed using the most rudimentary device. The representation of the external visual scene was provided by a cathode ray tube, which presented an artificial horizon and an outline of the carrier deck. A voltmeter served as the airspeed indicator. 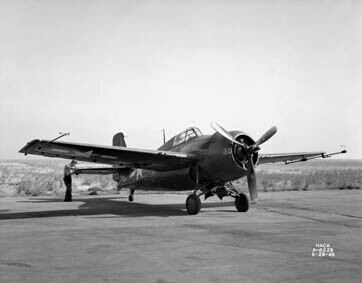 Throttle and center stick controls were provided, the latter with fixed spring restraints, with the pilot sitting in front of the lot on a swiveling stool. Everything was linked through an analog computer that performed the computation of the aircraft's dynamic response. Still, the results that were obtained helped to generalize the results that were obtained in flight, and the two together gave a clear indication of the best choice for the desired approach speed. At the culmination of these activities, Drinkwater, Cooper, and Innis all presented their views on the subject in references 59 and 60, with Innis introducing a STOL transport, the YC-134A, to the collection of fighters surveyed. These three men, along with the other members of the research pilot staff as they appeared in 1955, are shown in figure 65. Figure 65. Flight Operations Branch circa 1955. 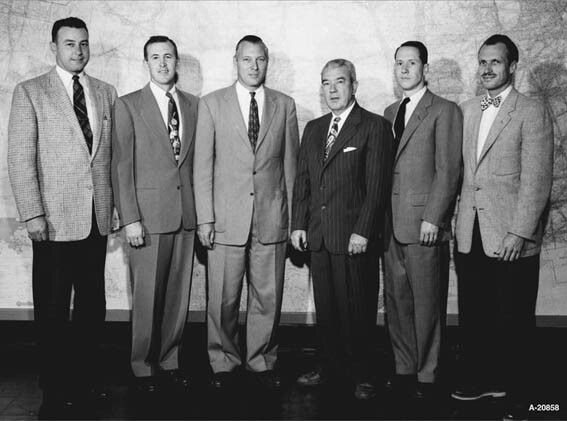 From left to right: Bob Innis, Don Heinle, Larry Clousing, Bill McAvoy, Fred Drinkwater, George Cooper. ....flying quality parameters and showed where motion simulation proved of value in the process (ref. 61). In concluding this section, it is appropriate to highlight what may be the most important contribution of the flying qualities evaluation programs and experiments conducted on the variable stability aircraft at Ames. This, of course, was George Cooper's standardized system for rating an aircraft's flying qualities. Cooper developed his rating system over several years as a result of the need to quantify the pilot's judgment of an aircraft's handling in a fashion that could be used in the stability and control design process. This came about because of his perception of the value that such a system would have, and because of the encouragement of his colleagues in this country and in England who were familiar with his initial attempts. Characteristically, Harry Goett spurred Cooper on in pursuit of this objective. 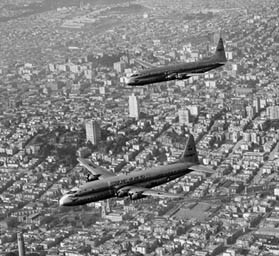 Cooper's approach forced a specific definition of the pilot's task and of its performance standards. Further, it accounted for the demands the aircraft placed on the pilot in accomplishing a given task to some specified degree of precision. The Cooper Pilot Opinion Rating Scale was initially published in 1957 (ref. 62). 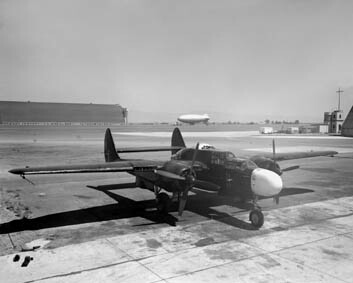 After several  years of experience gained in its application to many flight and simulator experiments and through its use by the military services and aircraft industry, it was subsequently modified in collaboration with Robert (Bob) Harper of the Cornell Aeronautical Laboratory and became the Cooper-Harper Handling Qualities Rating Scale (fig. 66) in 1969 (ref. 63). This rating scale has been one of the enduring contributions of flying qualities research at Ames over the past 40 years; the scale remains as the standard way of measuring flying qualities to this day. In recognition of his many contributions to aviation safety, Cooper received the Adm. Luis de Florez Flight Safety Award in 1966 and the Richard Hansford Burroughs, Jr., Test Pilot Award in 1971. After he retired, both he and Bob Harper were selected by the American Institute of Aeronautics and Astronautics to reprise the Cooper-Harper Rating Scale in the 1984 Wright Brothers Lectureship in Aeronautics. Figure 66. Cooper-Harper Handling Qualities Rating Scale. 15. Harry Goett and Bill Harper 1998: personal communication. 16. Seth Anderson 1998: personal communication. 17. George Cooper 1998: personal communication. 18. Ron Gerdes 1998: personal communication. 19. George Cooper 1998: personal communication.